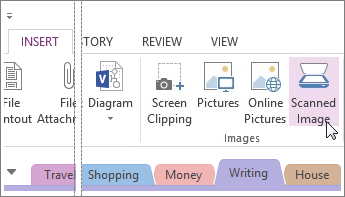 How can I Insert scanned images into OneNote? If you have OneNote 2013 and a scanner, you can add all sorts of things to your notebooks — old photographs, business cards, receipts, even napkin scribbles. This feature wasn’t as reliable as it needed to be, especially on 64-bit machines, so we made the decision to remove it from OneNote 2016, but there are other options for getting scanned images into OneNote 2016. Use Windows Fax and Scan to scan the file to your computer and then insert it into OneNote. To use this feature, search Windows for "Windows Fax and Scan." Download Windows Scan from the Windows 10 Store, scan the file to your computer, and then insert it into OneNote. Get the free Office Lens app for Windows phone, iPhone, or Android to use your smart phone as a scanner and send the images to OneNote. If the ability to add images from your scanner into OneNote is something you’d like to see added back, feel free to vote for it on UserVoice. Tip: If you don't have a scanner, you can use your smart phone and the Office Lens app for Windows phone, iPhone, or Android to capture notes and info from whiteboards, menus, signs, or anything with a lot of text and send the images to OneNote. Click the page where you’d like the scanned image to appear and click Insert > Scanned Image. Choose a scan resolution by clicking either Web Quality (best choice for on-screen display only) or Print Quality (best choice if you plan to print the page). Your scanner may also show you additional options. If you’ve scanned a picture that contains text, you can have OneNote read and copy text from the picture. Note: Scanning isn’t available if you’re using the 64-bit version of OneNote on a 64-bit version of Windows.